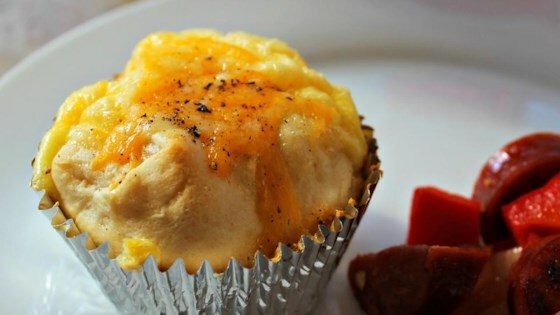 "Eggs, bacon, and cheese are baked in a biscuit cup for a delicious breakfast, lunch, or dinner." Place bacon in a large skillet and cook over medium-high heat, turning occasionally, until evenly browned, about 10 minutes. Drain bacon slices on paper towels. Crumble or chop into small pieces. Separate 6 biscuits into 2 rounds each. Press rounds into 12 cups of a muffin tin, pressing up sides to form biscuit dough cups. Mix eggs, bacon pieces, and 1/2 cup shredded cheese together in a bowl. Fill muffin pan biscuits with egg mixture about 3/4 full. Sprinkle remaining 3 tablespoons cheese on top. Bake in preheated oven until egg mixture is set, 18 to 22 minutes. Let cool 5 minutes before serving. Do not overfill muffin cups or the egg mixture will spill over. Place foil under muffin pan when baking for easier cleanup. It turned out really good but I should have had it cooked a little longer. This recipe was good but we could've added more cheese, other than that this recipe is delicious. maybe add some seasonings? great recipe though!